I always love dramas because of the way they tell stories, express ideas, and were being watched, absorbed and even accepted by audiences. I watch different countries’ dramas, and the American and Japanese ones are my favorites. They are professional productions with their own world view. And medical dramas are a good genre to show both of these two characterizations of these two countries’ TV drama productions. However, four years ago when I had a chance to start working in a hospital, I surprisingly found out that none of the hospitals –the physicians, the nurses, the patients, even the atmosphere- are what I thought they should be like. I started asking myself then, about where did I get all those thoughts and images of the hospital, since I barely had chances to walk in and talk with any person in it. The answer is clear: the medical dramas. They have capacity of being able to showing the “inside” of hospitals which normal people usually don’t have the access to enter, in a comprehensive way within a series of ten or even more episodes. But dramas are so variable! Even with the same genre, it’s easy to tell that American and Japanese dramas have different perspectives, cultures, and social backgrounds. These elements are effecting the texts, and the texts are further effecting our imagination of this live and death field. So, my research question is: What’s the difference between American and Japanese medical drama? American medical drama: House M.D. However, my finding is limited. 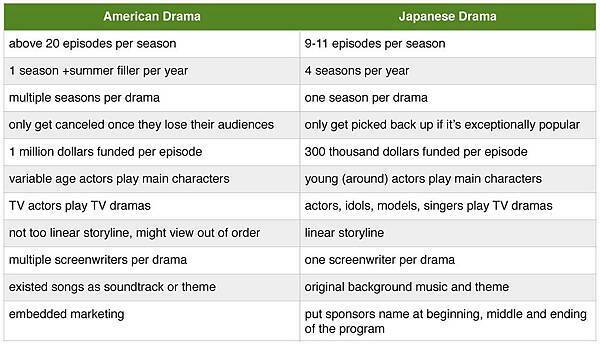 Most of them are the comparison of American and Japanese dramas, with the focus on the production, not the content. Here is a table I made based on the resources I picked last week, shows the MOST (not ALL) of dramas’ characteristics of America and Japan. Since that my resources didn't answer my question, I decide to take this result as a pilot research, and hope I could have a chance to do the further research in the near future. For example, if you take this two clips/dramas aforementioned, in my opinion, first, House M.D. describes a extraordinary situation in a simple, straightforward way, while Iryu expresses a daily event in an exaggerative way. All the lines, lights, shots are giving impacts to these techniques of expression. Moreover, I also want to know how these two countries’ medical dramas shape the clinical ethic, the images of staffs, the communication between hospital and patient/family differently, thus influence the audiences’ value. After all, I’ve learn things from my resources, especially that I found out that there are Americans who love Japanese dramas and Japanese who love American dramas, and they share their though online. But I must do something to contribute as one of the resource as well in the future. How do you think about this topic? Do you like American/Japanese medical dramas? How does those two clips make you feel?